One man has been arrested on suspicion of an offence under the explosive substances act. 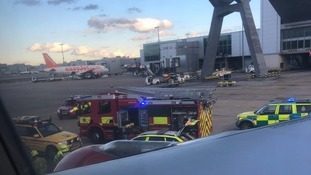 An aircraft had to be evacuated at Gatwick Airport on Wednesday afternoon after a ground handling employee was injured. It was one of the largest social upheavals of modern times. At the start of the Second World War, more than three million British children were evacuated from cities into the countryside. Today, at their annual reunion, a few dozen wartime evacuees have been remembering how they were sent away from Southampton. Richard Slee reports.